A survey published today by consumer magazine Which? 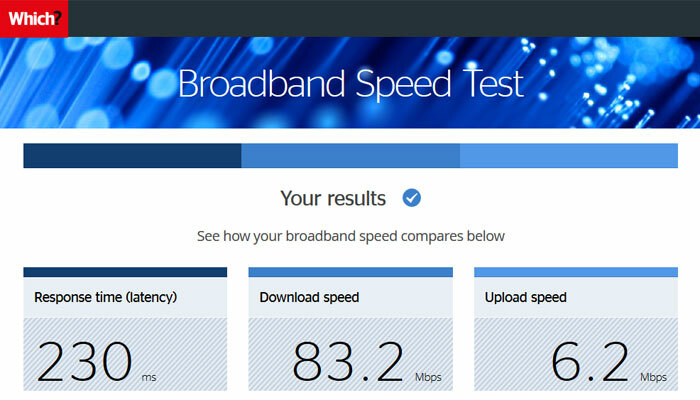 asserts that "broadband services are, on average, 51% slower than advertised," here in the UK. A large sample of the population took part in the survey: 235,000 people used the Which? online speedchecker tool during the year ending 30th April 2018. The consumer publication concludes that the average customer pays for broadband speeds of up to 38Mbps yet only achieves half of that (19Mbps). Which? reckoned it would be intere4sting to share this survey data ahead of the new Advertising Standards Authority (ASA) guidelines coming into effect on Wednesday, 23rd May. HEXUS previously reported about the new advertising guideline last month. In essence, all UK broadband providers will have to advertise the average speeds of their respective offerings or face fines/sanctions. 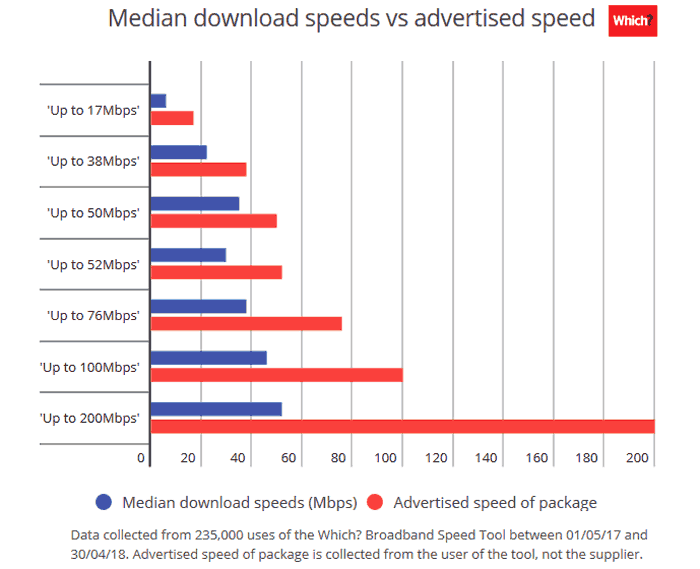 Back in April we noted that Sky Broadband advertising was already getting in line with the new regulations by quoting the average download speeds of its package offerings. Commenting on the new results and upcoming changes in advertising rules Which? managing director of home services, Alex Neill, said "This change in the rules is good news for customers, who have been continuously been let down by unrealistic adverts and broadband speeds that won’t ever live up to expectations." Neill went on to say how speed and reliability of broadband are really important to customers. An interesting graphic was shared by Which?, tabulating its results, as reproduced above. According to an email that I received today from Cable.co.uk consumer telecoms analyst Dan Howdle, the above graph exposes a flaw in the Which? survey. Howdle explains that Virgin is the only ISP to advertise an 'Up to 200Mbps' internet service. Recent Ofcom testing showed that Virgin's 200Mbps service averaged 92 per cent of the advertised speed at peak times. Therefore the Which? results have probably been tainted by poor Wi-Fi connections in user dwellings. Furthermore, the average person in a family might have their speedtest result slowed down due to other people using the broadband connection at the same time. the Which? results have probably been tainted by poor Wi-Fi connections in user dwellings. Seems a reasonable shout to me. Whilst I currently get similar speeds on both 2.4GHz and 5GHz wifi, in the evening the 5GHz can be as much as twice as fast as the 2.4GHz based on speedtest results to the same server. I honestly never thought I'd see the day that localised wifi interference would bottleneck my internet connection, but here we are…! I get above my quoted speed. Paying for 350/20, receive 390/21. Furthermore, the average person in a family might have their speedtest result slowed down due to other people using the broadband connection at the same time.